EZQual is an automated software application for discrete frequency qualification of reverberation chambers in accordance with industry standards such as ISO 3741 and ANSI S12.51 (2010 versions) and AHRI standards such as AHRI 220 and AHRI 260. The number of test frequencies required to satisfy the requirements of these qualification procedures make this one of the most time consuming and tedious qualification methods in standardized acoustic testing. And often the qualification measurements need to be performed several times on a “trial and error” basis, as modifications to the reverberation chamber are made in an attempt to meet the sound pressure level standard deviation based diffusion requirements outlined in these test methods. 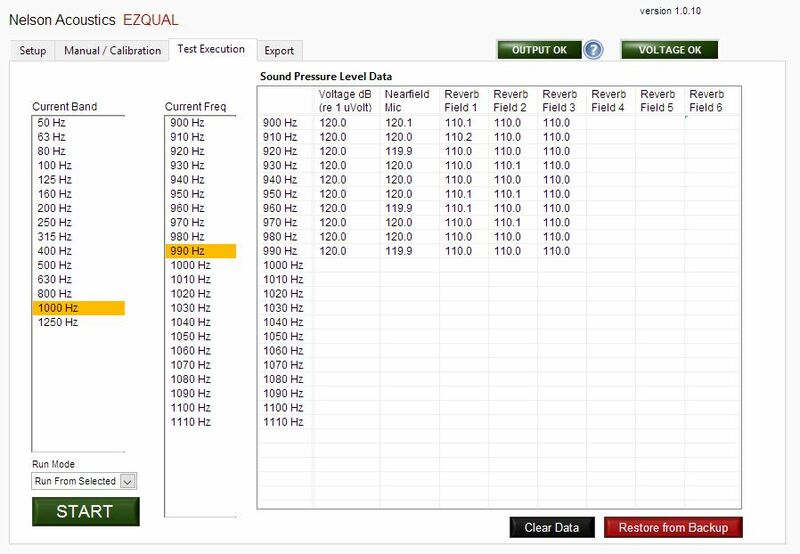 EZQual automates this qualification testing using our Trident acoustic analyzer software Application Programming Interface (API) to operating National Instruments signal generation and data acquisition hardware to acquire up to 360 sound pressure levels, organize them by frequency band and export them into pre-configured Excel workbooks for analysis. The Trident acoustic analyzer software application can also be used to conduct sound power level determinations using the same National Instruments hardware, allowing you to qualify your chamber with the same hardware and software you will be using for sound power level determination. EZQual and Trident run on any of the National Instruments Digital Signal Analyzer devices including both the cDAQ USB devices and the PXI 446x series devices. EZQual setup allows you to configure the qualification measurement to meet the needs of your reverberation chamber and instrumentation system. EZQual provides a manual operation mode that can be used to both calibrate your system and test signal levels prior to an automatic execution. EZQual Automated Test Execution mode is designed to allow you to Start It, Walk Away and come back to get your data. EZQual is designed to make it easy to export your test results into pre-configured Excel analysis templates that conduct the standard deviation and criteria comparison analysis. Please contact VIacoustics at info@viacoustics.com for more information and an online demonstration of this product. Please contact VIacoustics at info@viacoustics.com for information on pricing.